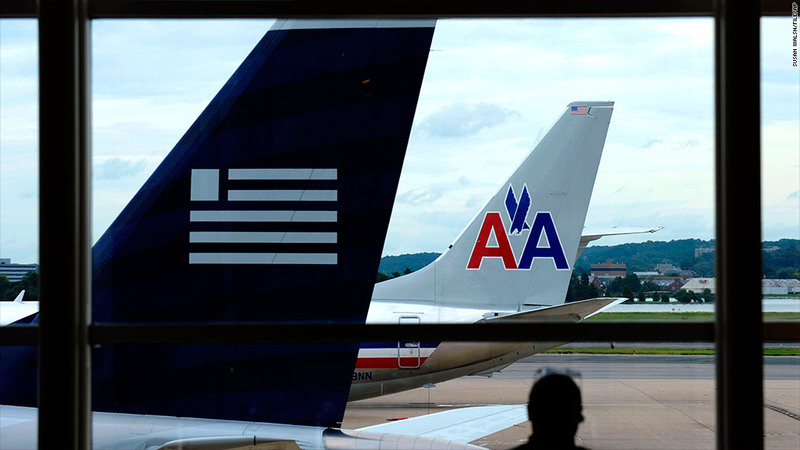 US Airways and American Airlines are now set to merge into the largest airline company on Dec. 9. A federal bankruptcy court judge has cleared the way for American Airlines and US Airways to merge into the world's largest airline company, dismissing a final objection from a group of airline passengers trying to block the deal. Judge Sean Lane approved an antitrust settlement reached earlier this month between the airlines and the Justice Department. Justice's earlier objections to the deal had been the major impediment to the merger. While the passenger group has indicated that it intends to pursue a private antitrust case against the merger, Lane ruled that should not stop American parent AMR (AAMRQ) from emerging from bankruptcy and combining with US Airways. The passengers still believe the merger will result in higher fares and reduced choice. The merger of the two companies is now set to take place Dec. 9, with the shares in the new combined American Airlines trading under the symbol AAL. Passengers will still be booking flights under both the American Airlines and US Airways (LCC) names for some time. Details about when the airlines will combine reservations and ticketing, frequent flier clubs and other operations are still being worked out, and those combinations are not likely until the beginning of 2014, at the earliest. The formal combination of the companies' two separate operating certificates with the Federal Aviation Administration might not take place until 2015. But the combined company that will exist on Dec. 9 will be the largest airline in the world in terms of revenue, passengers carried and the number of miles flown by paying passengers, surpassing United Continental Holdings (UAL), which was also formed by a merger.